E-commerce firm Snapdeal is in talks to raise funds from existing investor Softbank, which could see its valuation fall below $3 billion, a financial daily reported on Wednesday. Jasper Infotech Pvt. Ltd., which runs Snapdeal, is looking to raise approximately $300 million, of which $100-150 million could be from SoftBank, a report by The Economic Times stated, citing four unnamed sources. In January, Snapdeal and SoftBank were in discussions to raise fresh funds but at a lower valuation ranging between $3 billion and $4 billion. SoftBank had pared down its investment value in Snapdeal in November last year. "We are well capitalised and not engaged in any active financing discussions," a Snapdeal spokesperson had said at that time. The e-commerce firm had last raised funds in February 2016, securing $200 million (Rs 1,362 crore) at a valuation of $6.5 billion from Canada-based Ontario Teachers' Pension Plan and Singapore-headquartered investment firm Brother Fortune Apparel. 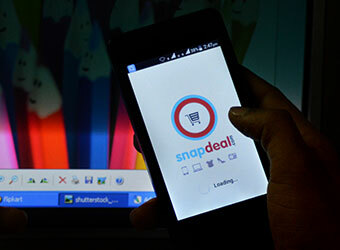 In total, Snapdeal raised around $1.65 billion from about two dozen investors. These include SoftBank and SoftBank-backed Chinese e-commerce company Alibaba, Taiwanese contract electronics manufacturer Foxconn, global online marketplace eBay Inc., the Indian ad-for-equity investment arm of media firm Bennett Coleman & Co. Ltd, and venture capital investors such as Bessemer Venture Partners, Intel Capital and Kalaari Capital, among others. VCCircle had last week reported that Snapdeal is in talks to sell FreeCharge with several strategic companies, including fintech firms Paytm, PayPal and PayU, after talks with private equity investors fell through. The company is seeking a valuation of $400-$500 million for the same. Snapdeal has been working towards reducing ballooning operational costs to check widening losses. The e-tailer had more than doubled its losses to Rs 2,960 crore (around $436 million) for the financial year ended 31 March 2016. The firm's consolidated loss widened to Rs 3,315 crore from Rs 1,328 crore in 2014-15. Last month, Snapdeal founders Kunal Bahl and Rohit Bansal said they will not take salaries for an undisclosed period, after laying off over 600 people from the company. Rival Flipkart is also suffering from valuation woes. Just last week, Macquarie Group-owned Optimum Fund's decided to lower the value of its holdings in the company by 3.26%, which sees Flipkart's valuation at just $10 billion.